At Dwell360, we keep our finger on the pulse of the real estate market in Metro Boston. To that end, we have produced 2012 year end market reports for more than 20 towns in the area. They contain residential market data and statistics for the sales of single family homes, condominiums, and multifamily homes over the past ten years. Read our reports for valuable insight into the ever-changing real estate market in your neighborhood and the surrounding areas. In most towns, the number of homes sold is up, the average sales price is up, and the days on the market are down. 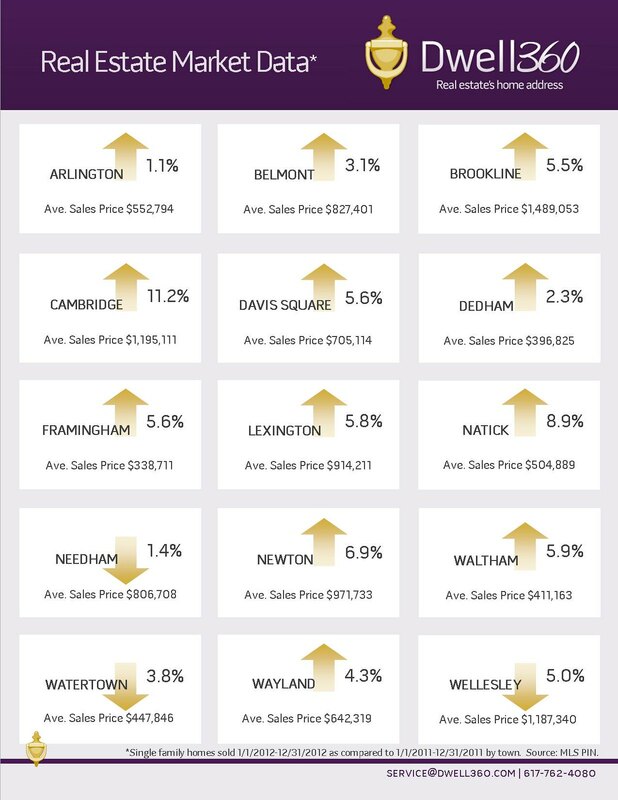 These signs point toward recovery in the real estate industry in eastern Massachusetts, and hold promise for continued success in 2013. Browse our library of market reports below, and please contact us at service@dwell360.com for more specific or up-to-date information for your area. The positive changes we have seen in the market will continue to be true in 2013, but will require sophisticated navigation to ensure success. Dwell360's real estate agents use an innovative and progressive marketing approach to connect with today’s buyer. We combine a positive attitude, state-of-the-art digital marketing, and time-tested marketing tools that create an impact. Contact us to navigate through this changing time in real estate with agents both progressive and experienced in today’s market.